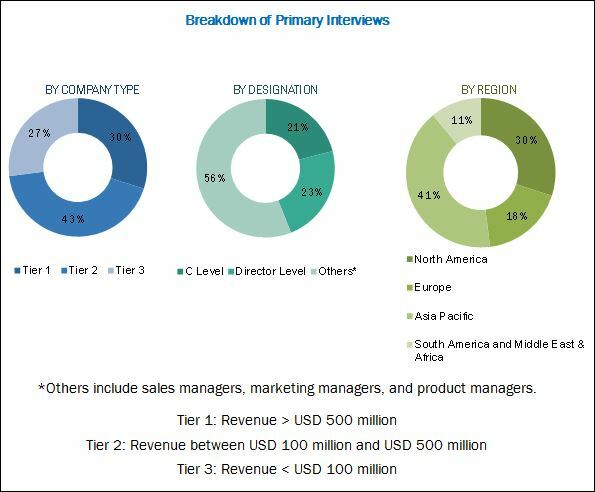 [154 Pages Report] on Armor Materials Market is estimated at USD 8.67 Billion in 2017 and is projected to reach USD 12.11 Billion by 2022, at a CAGR of 6.92% from 2017 to 2022. The base year considered for the study is 2016, and the forecast period is from 2017 to 2022. Both, top-down and bottom-up approaches were utilized to estimate and project the size of the armor materials market. The size of the armor materials market was calculated, and weightages were assigned to various market segments. This was performed on the basis of extensive primary interviews and secondary research based on the information available on websites of various associations, such as the US Cavalry & Armor Association, United States Armor Association, American Armor Association, Association of the United States Army. Primary research included extensive interviews with key personnel such as CEOs, VPs, directors, and executives. After arriving at the overall market size, the total market was split into several segments and subsegments. The data triangulation and market breakdown procedures were employed to complete the overall market engineering process and arrive at the exact statistics for all segments and subsegments. The breakdown of profiles of primary respondents is depicted in the figure below. The ecosystem of the armor materials market comprises manufacturers of armor material products, such as include E. I. Du Pont De Nemours and Company (US), DSM NV (Netherlands), Honeywell International Inc. (US), Compagnie de Saint-Gobain SA (France), Allegheny Technologies Incorporated (US), 3M Ceradyne, Inc. (US), Alcoa Inc. (US), Royal TenCate NV (Netherlands), Saab AB (Sweden), CoorsTek Inc. (US), Morgan Advanced Materials (UK), CeramTec GmbH (Germany), Tata Steel Limited (India), AGY Holding Corp. (US), PPG Industries Inc. (US), and end users such as military & defense, aerospace, and law enforcement agencies. 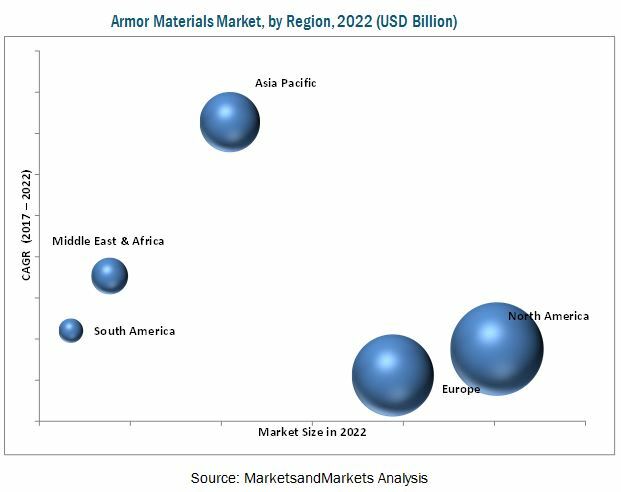 The armor materials market is projected to grow from an estimated USD 8.67 Billion in 2017 to USD 12.11 Billion by 2022, at a CAGR of 6.92% during the forecast period. The growth of this market is primarily attributed to the changing battlefield scenarios and development of advanced weapons and ammunition which in turn is expected to lead to an increase in the demand for better and more effective armor solutions. The armor materials market has been segmented on the basis of product type, application, and region. On the basis of product type, metals & alloys lead the armor materials market due to their high structural ballistic protection properties and their low cost. Ceramics are the fastest-growing armor material types on account of their low weight and high rigidity. Ceramics are increasingly being used in vehicle and body armor applications to reduce the weight of units. On the basis of application, the armor materials market has been classified into vehicle armor, aerospace armor, body armor, civil armor, and marine armor. The body armor segment is projected to grow at the highest CAGR between 2017 and 2022. The demand for body armor is increasing due to the rise in homeland security concerns along with the increased requirement for these protection systems by law enforcement agencies. Based on region, the armor materials market has been segmented into North America, Europe, Asia Pacific, South America, and the Middle East & Africa. North America is the largest market for armor materials and is expected to continue to lead the market by 2022. The US is a major armor materials consumer in the region as well as globally, owing to rising homeland security concerns due to terrorism. The Asia Pacific is projected to be the fastest-growing market for armor materials driven by increasing defense budgets, military modernization programs, rising tensions between countries in the region, along with terrorism and insurgency incidents. The armor materials market is sensitive and regulated by a number of governmental restrictions and regulations, which restricts manufacturers when dealing with other companies in different countries. The high cost of production for most of the armor materials and issues related to raw material procurement are other factors that are restraining the growth of the armor materials market. Agreements and expansions were considered the major development strategies adopted by key players operating in the armor materials market between 2013 and May 2017. Companies such as E. I. Du Pont De Nemours and Company (US), DSM NV (Netherlands), Honeywell International Inc. (US), 3M Ceradyne, Inc. (US), and Royal TenCate NV (Netherlands), adopted these development strategies to enhance their product offerings and customer base as well as gain a competitive edge over their peers in the market. These companies are also focused on investing in research & development activities to introduce new and cost-effective materials to keep up with the changing consumer needs. Top Companies Analyzed for This Study are — Allegheny Technologies Inc.; E. I. Du Pont De Nemours and Company; Royal Tencate NV; 3M Ceradyne, Inc.; Honeywell International Inc.; DSM NV; Tata Steel Limited; Compagnie De Saint-Gobain Sa; Alcoa Corporation; Saab AB; AGY Holding Corp.; PPG Industries Inc.; Morgan Advanced Materials; Ceramtec GmbH; Coorstek Inc.; Xeracarb Ltd.; AT&F Advanced Metals LLC; Waco Composites; Leeco Steel LLC; Protective Structures, Ltd.; CPS Technologies Corp.; Surmet Corporation; JPS Composite Materials; Schunk Carbon Technology; Cerco Corp.